Renowned company Stadium Consultancy is working on a financial framework for new stadium in Helmond. The idea of building from scratch has been resurfacing here in recent years and may finally come to fruition if the consultants find it feasible. Results of their work should be released to the city council in late September or early October. Final capacity of the stadium is yet to be established, though it’s planned to be a fully enclosed building with audience on all four sides. Economic viability will surely influence the planned facilities, but so will the future use. The stadium won’t only become home to Helmond Sport (2nd league), but also several smaller football teams. 8 full-sized fields will serve them, which sounds impressive until you realize that currently on the site there are 10 pitches! Some room will be taken by an indoor hall though, to be financed by local school. 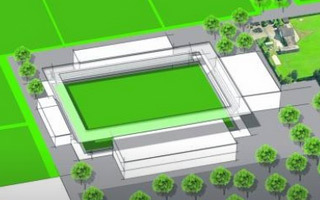 The existing Lavans Stadion will be demolished and transformed into a training field, while the new one is to stand just meters north of it.